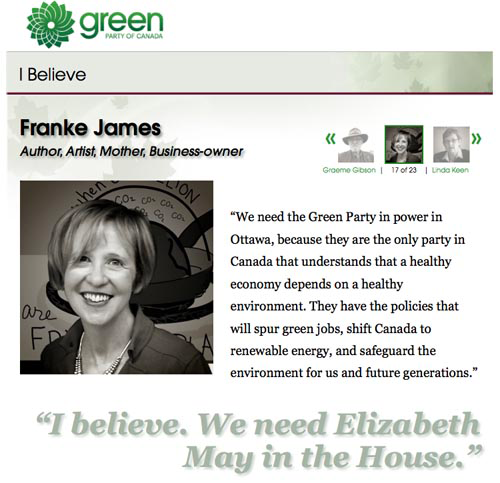 During the recent Federal Canadian Election, I was delighted to be asked by the Green Party of Canada — along with conservationist and author Farley Mowat, author and environmental activist, Margaret Atwood, and twenty other Canadian writers, artists and newsmakers — why I believe Elizabeth May should be in Ottawa. You’ll find me at Number 17, between writer and conservationist, Graeme Gibson, and nuclear safety whistleblower, Linda Keen. May 2nd, 2011: That’s the date to circle in your calendars. Elizabeth May made Canadian history that day by winning her seat in Saanich-Gulf Islands, and becoming the first Green Party member elected to the House of Commons. Let’s hope this is a trend! We need more Greens in power, for all the reasons I cited in my quote — and which I explore more fully in my visual essays and in my book, Bothered by My Green Conscience.